I am really jazzed to share the news of my upcoming Educause Learning Initiative web seminar! It is open to all ELI members and I am hopeful my students' voices will contribute to encouraging other educators to take risks with innovative uses of technology to enrich learning and expand face-to-face time and increase active learning in the classroom. If you can't join us for the presentation, please click on the link below and listen to the 20-minute "Student Interview" at the bottom of the page to hear end-of-the-semester reflections from some of my students. Enjoy! As always, comments are welcome and appreciated. Malcolm Brown, EDUCAUSE Learning Initiative director, will moderate this web seminar with Michelle Pacansky-Brock, where she’ll pull back the curtain on the classroom of the future, exploring a semester-long teaching experiment in which a class of community college art history students engaged in a technology-rich, web-enhanced, inclusive learning environment. 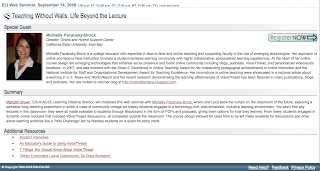 You won't find any lectures in this classroom: they were all made available to students through Blackboard in the form of PDFs and podcasts, giving them options for how they learned. From there, students engaged in dynamic online modules that included VoiceThread discussions, all completed outside the classroom. The course design allowed for class time to be left freely available for discussions and other active learning activities like a "Wiki Challenge" led by fearless students on a quest for extra credit.